Animals have individual abilities to defend themselves against predators, but the Three Banded Armadillo has an extremely unique method of protection. He doesn’t run, camouflage himself or fight. He rolls into an armored ball that will snap shut like a trap when anything threatens its life. When the threat has passed he will unroll and go about his business – his armor quickly available for the next danger he faces. The Three Banded Armadillo makes its home in Bolivia, central Brazil, Paraguay, and Argentina. This class of armadillo doesn’t bother to dig his own burrows, but hunts discarded anteater burrows for shelter. It enjoys grassy or marshy areas near forests. These blackish brown armadillos are the only species that can completely encase their entire bodies within their shell when they curl into a ball. The disconnected front and rear portions of the shell allow the animal to accomplish this feat. The five-toed hind feet resemble a hoof in appearance. The middle three toes grow together, leaving the outside toes free. The claws on their front feet are extremely powerful, and the armadillo walks and runs on the tips of these claws. A short, thick tail tapers the rear of the Three Banded Armadillo’s 218-273 mm, 1.0 – 1.50 kg body. Three Banded Armadillos hunt for food by burrowing into underground nests and under decaying vegetation. Beetle larvae are its main staple, but its intake includes ants, termites, other insects and fruit when it is available. It requires one hundred and twenty days for the gestation of a baby Three Banded Armadillo. Sometime between November and January the female will give birth to a single baby. The miniature armadillo will be a replica of its parents, and has the ability to curl into a ball immediately following birth. The young will nurse for about seventy-two days before being weaned. In nine to twelve months it will have matured enough to have small armadillos of its own. These armadillos prefer to be alone, but on a cold day may allow another armadillo to share its burrow. An observation of twelve armadillos sharing shelter has been recorded, but considered to be quite rare. 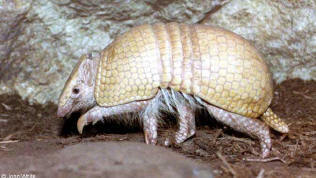 E-mail info@brazilianfauna.com to add your Three Banded Armadillo related website. Pearson, David L. (November 2001). Brazil – Amazon and Pantanal. London. Academic Press.